Nothing says love like Lab. There's a reason the Labrador retriever has consistently ranked among the highest breed registrations in the American Kennel Club. Simply put, they're great dogs. Loving, loyal, friendly, athletic - what's not to like? However, that Lab energy needs proper channeling and training. You know you should feed your Lab a high-quality dog food. That's the easy part. The hard part is not giving in to those pleading brown eyes as he watches you consume meals or snacks. Don't do it. Keeping your Lab at the right weight might add years to his life. Labs, especially young ones, are notorious for eating inappropriate - that is, non-food - objects. Give him safe toys designed for dogs and do your best to keep things he might chew on out of reach. If scientists could capture your young Lab's energy, it could probably power your whole house. He needs lots of exercise, or all that energy might be channeled into less-desirable activity - like eating the furniture. Since he's a retriever, being in the water is second nature. Take him for jogs, long walks and swims. Be careful if you have a swimming pool - your Lab is likely to be in it more than anyone else if you don't deny him access. While basic obedience training is important for all dogs, it's especially so for the Lab. Not just because it helps him use his energy in positive ways, but because it helps him mentally and he's such a trainable dog. There's a reason why Labs are the top choices as service dogs for the blind and disabled. He likes to have a job and is good at what he's trained to do, whether it's as a field dog for hunting, therapy dog, search-and-rescue or canine athlete in agility, obedience or flyball. Get this whiz of a dog started early in puppy kindergarten classes. Whether black, yellow or chocolate in color, Labs shed a lot. You might want to redo the basic color schemes in your home to black, tan or brown, depending on your Lab's shade, to camouflage the dog hair. Give him a thorough brushing every day to minimize the amount of hair that ends up on you and the furniture. 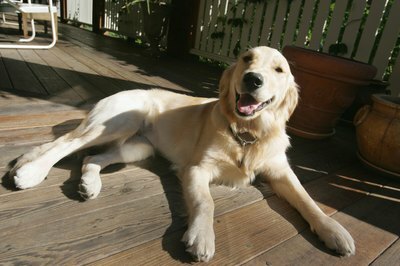 Ask your vet about supplements, such as flaxseed oil, that promote healthy coats and might reduce shedding. Invest in a high-quality vacuum cleaner, as you'll use it a lot. How Often Do Newborn Cockatiel Birds Eat?